Perry's Hannah Peterson presses the ball as Molly Lutmer (14) and Lillian Robles (44) also defend on the play, which resulted in a turnover. 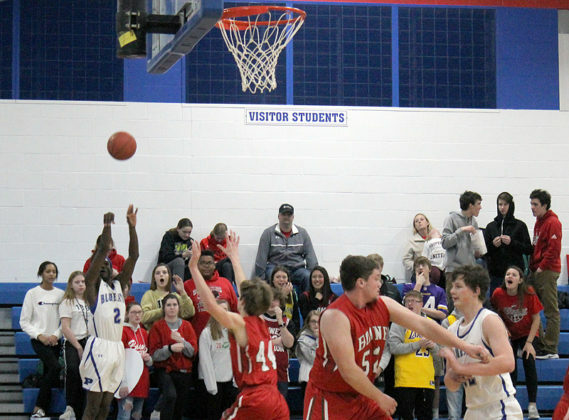 Perry honored senior members of both basketball teams, their cheerleaders and members of the pep band Tuesday, but the occasion was somewhat sullied by a pair of lopsided defeats delivered by Raccoon River Conference rival Boone. Boone (12-7, 6-6) was a 60-23 victor over Perry (1-18, 0-12) in the girls game, with the Toreadors (11-6, 7-5) cruising to a 55-15 win over a flat Bluejay (0-17, 0-12) team in the nightcap. The teams had met Jan. 8 in Boone, with the hosts winning the girls match, 60-23, and the boys scrap, 71-32. 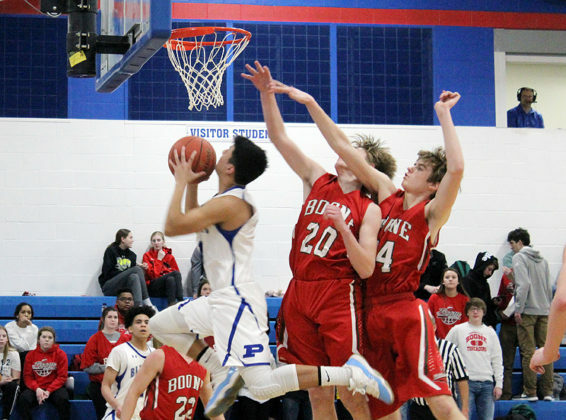 Perry allowed repeated second chances at the basket throughout the opener, allowing Boone to consistently score as a result of offensive rebounds. The visitors opened a 22-7 gap after one quarter, but Perry stayed nearly even in the second period to enter the half trailing 34-18. Unfortunately the Jayette offense went missing in the third quarter, as a 15-3 run pushed the Toreadors into a 49-21 lead with one quarter remaining. 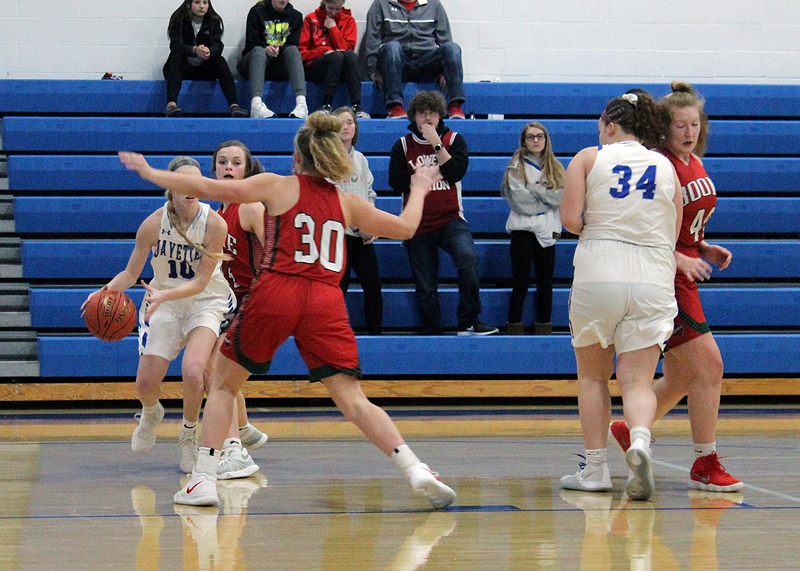 Quinn Whiton and Gabby West each had 10 points for Perry, with Molly Lutmer adding four points, Ainsley Marburger three and Jayna Kenney two. Whiton hit two 3-pointers, with West and Marburger each sinking one trey. 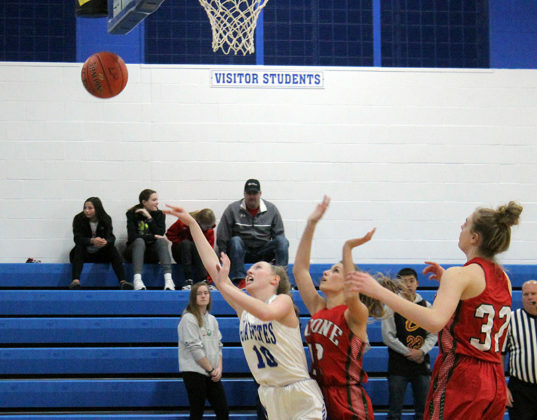 Boone splashed 11 shots beyond the arc, with Madlyn Danner hitting four as part of her game-high 16 points. Emma Dighton scored 12 points and Emily Ades 10, with eight points from Ashley Behrendt, five from Emma Lewis, four apiece from Zoey Hightshoe and Megan Osborn and three from Katie Winter. 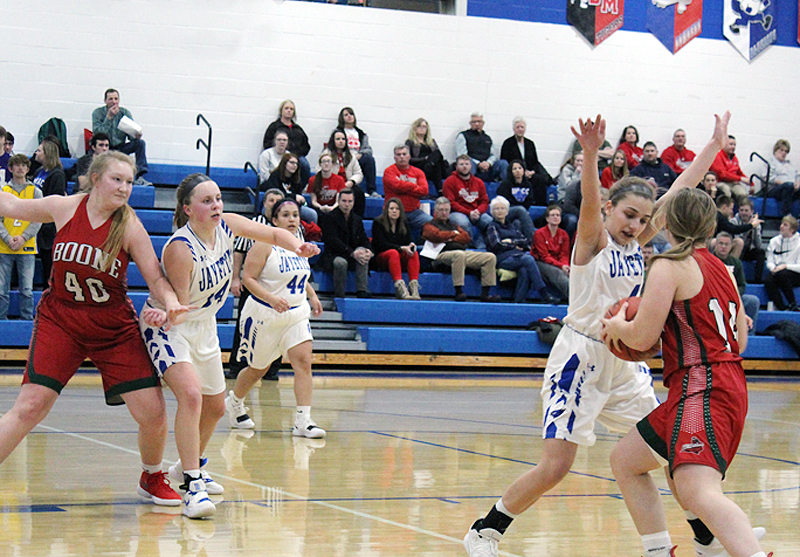 The Bluejays, like the Jayettes, struggled throughout their game to keep the Toreadors from repeatedly scoring second-chance points. Boone raced to a 20-9 lead after the first quarter, then watched a Perry offense struggle to overcome turnovers and to manage open shots, with the hosts making only one basket in each of the final three quarters in suffering the lopsided loss. Perry’s three baskets in the final 24 minutes of play resulted in the fifth game this season in which the team has not reached 20 points. Brendan Ivory’s seven points and four each from Kegan West and Carlos Calderon accounted for the Bluejay offense. Eleven Toreadors scored in the win, with 16 from Justin Aspengren and 13 from Quali Sporaa leading the way. 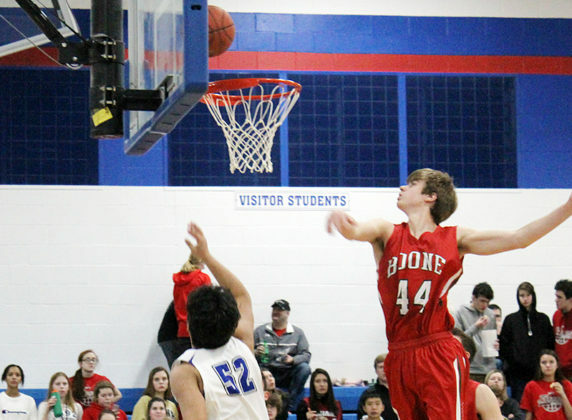 Alexander Sturtz had six points, Tyler Casotti five and Bret Price four. Tristan Pearson, Ryan Hulse, Joshua Hunter, Jonathan Garvey and Casey Hutchings scored two points each while Derek Rhinehart had one point. West and Lillian Robles were the Jayette seniors honored, with Mario Cruz, Roel De Jesus, Alex Morales, Alex Nunez, Roger Jacobson and Calderon were the Bluejay players saluted. 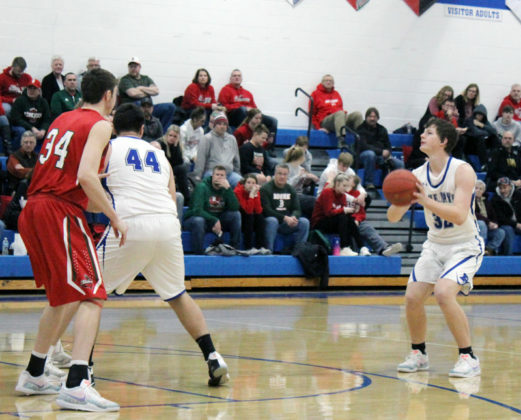 Perry visits Winterset Thursday and Bondurant-Farrar Friday. 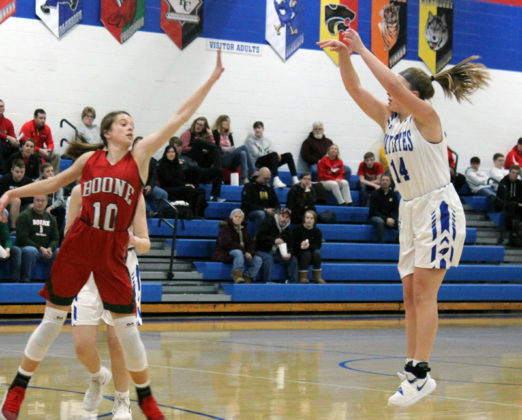 The Jayettes will open postseason play, at Boone, Feb. 13, with the Bluejays wrapping their regular season with boys-only trips to North Polk Monday and to Creston Feb. 14. Brendan Ivory puts the ball off the glass for Perry against visiting Boone. Perry's Gabby West (34) screens a Boone defender as Quinn Whiton (10) looks for space along the baseline. Perry's Kegan West lines up a 3-pointer behind the obstruction set by Alex Morales (44) in the first quarter against Boone Feb 5. Molly Lutmer's shot is away before Boone's Madlyn Danner can intervene during Perry's final home game of the season Tuesday. Perry senior Carlos Calderon scores from under the basket Tuesday against Boone. Perry's Quinn Whiton is fouled by Boone;s Emily Ades as she attacks the basket in the second quarter Tuesday. 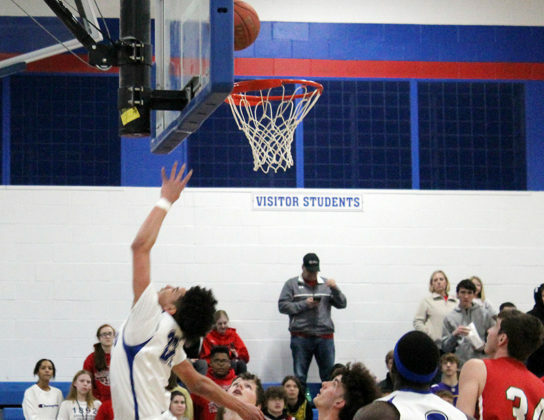 Mohamed Abdelnabi fires from the corner during Tuesday's RRC game with Boone. Perry's Kegan West (32) battles for a rebounding spot on the play.